I've almost always avoided talking about non-comics things on the Cube, and have pretty much never talked about anything that didn't at least originate in comics. I've preferred to leave that stuff on my little corner at the Hasslein Blog. But I thought this was important and personal enough that it should go on the Cube. Spoilers for The Legend of Korra follow. 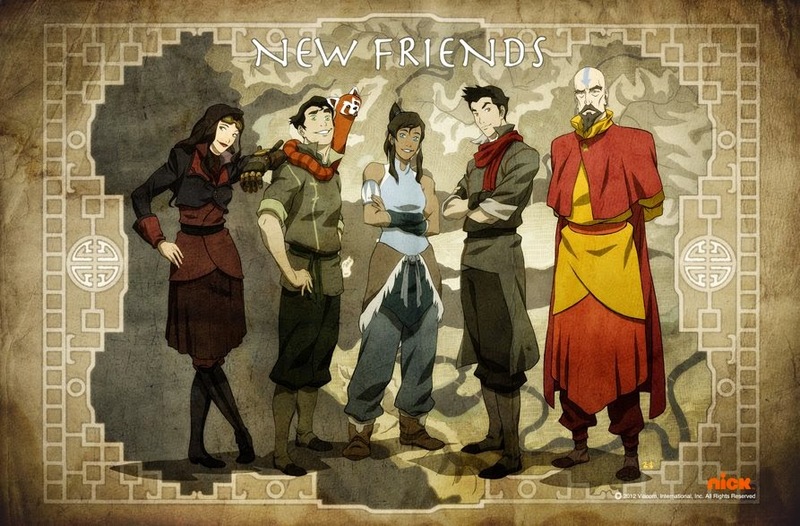 The Legend of Korra did not start out well for me, and at times I wanted to give up on it. A very large part of it is that I hold Avatar: The Last Airbender in high regard, and I had just finished a marathon of the whole series a week before starting Korra. 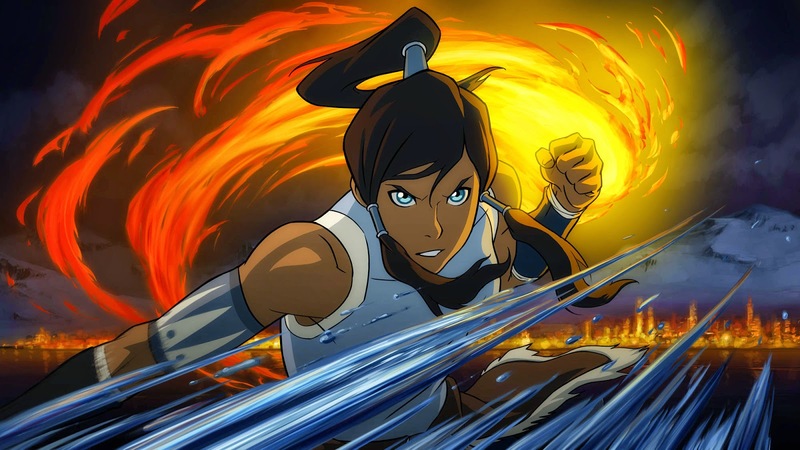 Korra, the Avatar, capable of controlling the four elements of water, earth, fire, and air, was the exact opposite of Airbender's Aang. Where Aang was a calm, serene, and soulful young boy, Korra was impulsive, headstrong, and quite frankly, whiny teenage girl. The shift from Aang's characterization to Korra's was so stark that she came off as really unlikable. I think maybe it would've been different if I had watched Airbender as it was coming out, and then waited the years-long wait for the spinoff, but that wasn't the case. As a result, despite having a female protagonist in Korra, the show didn't seem as progressive as its predecessor. Airbender was an incredibly progressive show — moving past all the obvious racial stuff, it actually featured more competent female characters than male ones. Azula was the most powerful firebender under the age of 30, and may in fact have been the most powerful firebender, period, if she weren't crazy. Katara eventually became the most powerful waterbender excepting maybe her mentor Pakku. Toph was inarguably the most powerful earthbender in the world and was the inventor of metalbending. Ty Lee, Suki, and Mai were the best at hand-to-hand combat (in that order, in my opinion). Prince Zuko was constantly portrayed as not being good enough as his sister (also, count the number of fights in the show he actually wins. His winning record is around 10%. ), and Sokka was portrayed very early on as not giving women enough credit and continually paying for it. Only Aang was truly a more powerful force than anyone, and that was by virtue of him being the Avatar. And even then, there's some strong implication that of all the Avatars, the most powerful and effective was Kyoshi, who lived for centuries and was the most commanding of them all. What I thought was really interesting was there was some sort of meta-commentary, intentional or not, with the Order of the White Lotus, a secret organization devoted to the unity of the Fire Nation, Earth Kingdom, Water Tribes, and the Air Nomads, being composed purely of men, while at the end of the show, the heroes are half female and half male. I love female heroes and I love female characters. I enjoy reading and watching fiction where the protagonists aren't like me in some fundamental ways, as I think finding common ground between me and the characters, or finding something in the characters to aspire to be, is a rewarding experience. I enjoy that experience and I like the fact that by virtue of existing, such fiction is telling girls to never settle for the discriminatory gender roles; that they, as people, can be whatever they want to be. Many of my closest friends are girls and I have a niece, and it's always cool to see them represented in fiction in much the same way I, as a male, am constantly represented to whatever extent I can say that sentence, being Filipino. But Korra wasn't working for me for most of two seasons, and it was pretty easy to figure out why. Korra seemed to never learn from her experiences and constantly had a temper. These are things we could all relate to if we had ever been teenagers, which Korra was when the show began, but as a man in his 30s, it was frustrating to watch. It got me to thinking the show wasn't for me. (And let's face it; it primarily wasn't. It was for people who had watched Airbender when they were younger and were now grown up.) And I was willing to accept that. What kept me watching the show through two seasons was realizing that Korra was basically this guy. 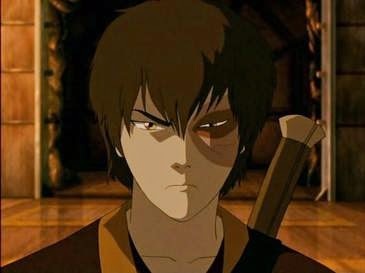 Prince Zuko in The Last Airbender had the same problems as Korra. He was impulsive, stubborn, headstrong, and seemed to never learn from his mistakes. You rooted for him to do the right thing and he almost always didn't do it (something that caused me to actually get up and yell at the TV several times, which rarely ever happens). He was a frustrating, annoying individual who, once he hit his turning points (there were two of them) and "came of age," so to speak, became my favorite character on the show. Korra also had two major turning points in my estimation, with the second one coming late in her fourth season. 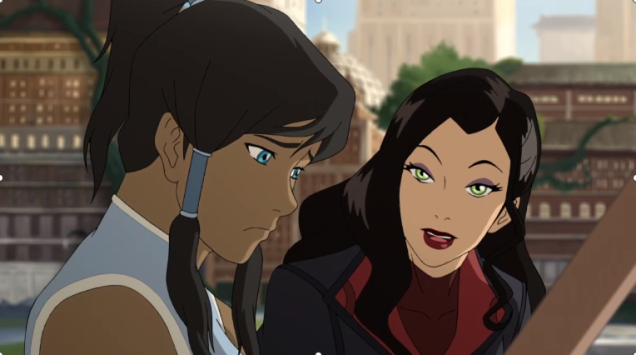 The two latter turning points are something I'm going to be talking about in a future column, but for me, the first turning point for our Water Tribe Avatar came in the beginning of the third season, when she started hanging out with Asami Sato. The romantic entanglements in Korra were painfully predictable and, if you ask me, forced in the first and second seasons, as they introduced a young firebender named Mako in the first episode as someone Korra had a crush on. Mako's the stereotypically heroic-looking dude there, with the red scarf. It sucked. It was forced. It was cliched. It was not entertaining. All throughout those two seasons, I could feel it. These two had no chemistry with Mako, whatsoever. I'm sure they tried, but again, characters can take a life of their own, and when it doesn't work, it doesn't work. There is no formula for writing fiction. There are ways to maximize the possibility of success, but no way to guarantee it. So the third season started and I guess the writers figured, hey, our supporting cast still has to interact with each other, but why would either of them want to hang out with Mako at this point? Let's pair 'em up and maybe we'll get some good stuff out of it. And right away, something clicked. Korra and Asami hit it off like two peas in a pod. Their exchanges together were crisp and sharp, and I have to imagine the voice actresses Janet Varney and Seychelle Gabrielle must have been in the same room as they recorded their lines, because the pairing just worked. They'd spent two seasons figuring out which one of them was better with Mako, and the answer was neither; they were better off on screen with each other. This was not a case of me thinking they should have gotten romantically involved; in fact, it was more something that reminded me of these guys. The showrunners of Buffy the Vampire Slayer paired up Buffy with Angel for two and a half seasons and with Spike for another two and a half, sparking a debate between fans on who Buffy should really be with (the correct answer is no one; they're both terrible for her). When Buffy ended, they moved Spike to Angel, and the pairing just clicked. Spike and Angel together were like two petty little boys, always trying to one-up the other. It was a pairing that was so much more entertaining than any pairing that happened on Buffy. So I figured that was basically it for Korra and Asami. They'd found a pairing that was entertaining on screen and could give us sharp dialogue when they were together. But where Spike and Angel were all about one-upping each other, Korra and Asami were all about protecting each other and growing together. When Korra would enter the Spirit World and her body needed protecting, Asami would be the one watching over her. And when Korra got poisoned at the end of Season 3, it was Asami that took care of her. 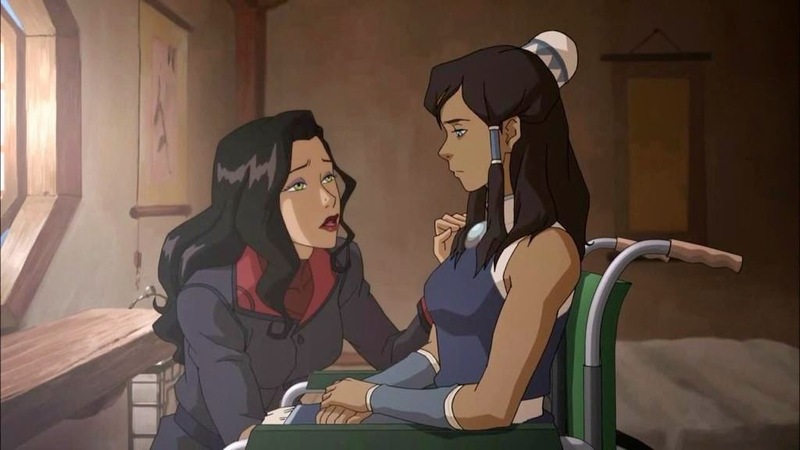 Already there were hints of something more happening with the two of them (there was no shortage of characters that could have taken care of Korra when she was poisoned), when Asami took Korra's hand and said, "If you need to talk — or anything — I'm here." Despite this, I know people who missed the clues, including when Korra wrote only to Asami in a three-year span of being gone, and Mako asking them, upon their reunion, "What's going on between you two? ", and all of these. These are things we wouldn't question if it had been a guy and a girl, or two guys. 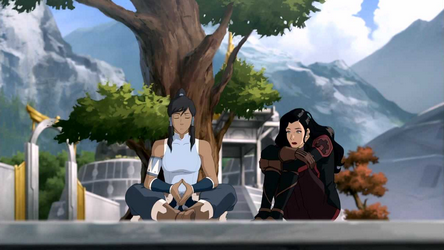 so maybe, as Konietzko says, "If it seems out of the blue to you, I think a second viewing of the last two seasons would show that perhaps you were looking at it only through a hetero lens." If you want to point out that they were both attracted to Mako first and showed no signs of being attracted to each other, I point to the trend of higher sexual malleability among women. But I didn't think it was out of nowhere, as I saw the hints. But I also didn't think it was going to progress beyond hints. 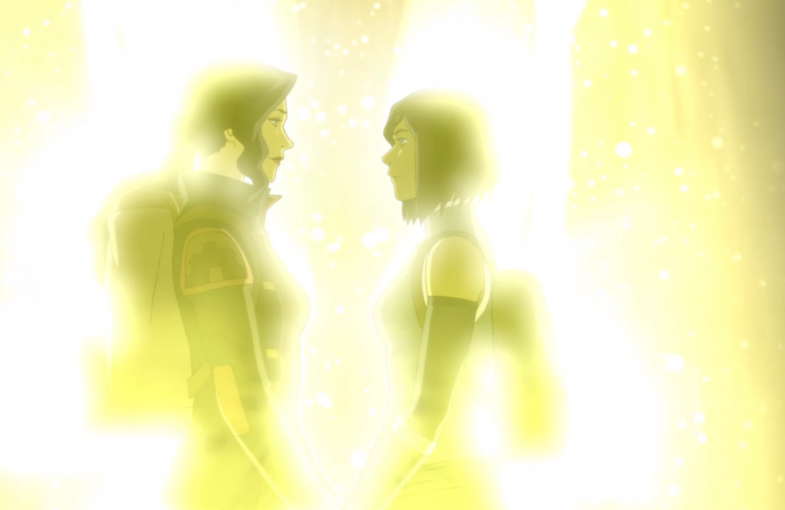 However, when the series ended, Asami and Korra went into a Spirit Portal together, to go on a vacation, just the two of them, with romantic music playing in the background as they held each other's hands and looked deeply into each other's eyes. I couldn't believe they did it. That was as close as they were going to get with a network show, and it was a huge step for animated shows and networks for children. And it made me happy. Yes, I know, I am a straight dude, and some of you are probably thinking "You're a straight dude, and you just rooted for it so you could perv," which you're free to think, but you'd be wrong (and you should also probably find real people to perv over). I rooted for Katara/Zuko during Airbender, for Buffy and Angel, for Faith and Spike, for Ross and Rachel, for Jerry and no one and Elaine and no one. I don't watch much TV but there has never been a shortage of attractive women I could pair together in my mind; this was the first time I actively rooted for it. And it was great. So it wasn't planned out; once again, the two characters just took on lives of their own. (And I agree with Avatar. I would be 100% in the Zuko/Katara camp if I didn't like Mai so much.) What's more, I think it was important. When I talk about the ending, or really, anything involving queer fiction, I still hear things like "Is that safe for kids?" I'm guilty of it too, actually, as my nephew would, some years back, watch Buffy with me, but lost interest in the middle of Season 4, before Willow got together with Tara, and I breathed a sigh of relief because I didn't know how to show that to him. It didn't feel like my place to do so. But it's ridiculous. It's stupid. What's there to be afraid of? Queer people exist. Bisexuals exist. Some of my best friends in the world, from childhood, are attracted to people of the same gender. They shouldn't be able to see themselves represented in fiction just because some uncle doesn't want to be the one to tell his nephew about it, just because some parents don't want to have conversations with their kids? (Spoiler: the kids can take it!) That's absurd, marginalizing, and condescending. It shouldn't be something to avoid, and The Legend of Korra, by going in this direction, made a bold statement that could go towards changing children's programming forever: homosexuals and bisexuals exist, and they're not something to be afraid of. Society planted in me early on the notion that people who weren't like me were people to be wary of, whether they differed due to skin color, sexual orientation, class, or even gender. But I've been lucky enough, fortunate enough in my life to have met people from all walks of life, to have learned that empathy, getting to know people from different backgrounds, and finding the good in them is a rewarding and enriching experience, much like and signficantly moreso than finding common ground with fictional characters who aren't anything like you. I had many prejudices when I was younger, all chipped away as I met different people from different backgrounds. There's still such a long way to go, so many people to meet, so many backgrounds to get to know. I would never call myself well-traveled, and given that, I think it would be really cool if fictio rejected cynicism as the synonym for realism and instead reflected the diversity and the beauty of the melting pot that is real life. Everyone should have role models. Everyone. So thank you, Legend of Korra, for taking a stand and a step forward, among the other steps forward you have already taken for diversity, and bonus points for somehow being able to do it organically, without tokens and motifs being pushed down our throats. It wasn't always a great ride, but it was a rewarding one, and I will miss it. Duy thinks there's a whole column to be written about the fact that they paired up two women in a fictional work and it led to a romance. Are genuine platonic friendships that pass the Bechdel Test that rare? And also, there'll be something about Dancing Dragons and Spirit Vines soon enough.